In the world of amateur (ham) radio morse code communications, QSK refers to a method of operation where the transmitter and receiver are alternately active when the key is down or up. QSK is also known as full break-in keying. QSK operation allows the operator to hear what is happening on their frequency in the brief times between transmitting morse code dits and dahs. The conversation can be quickly interrupted by the other station, or by a third station. The sender also knows immediately if their signal is being interfered with. 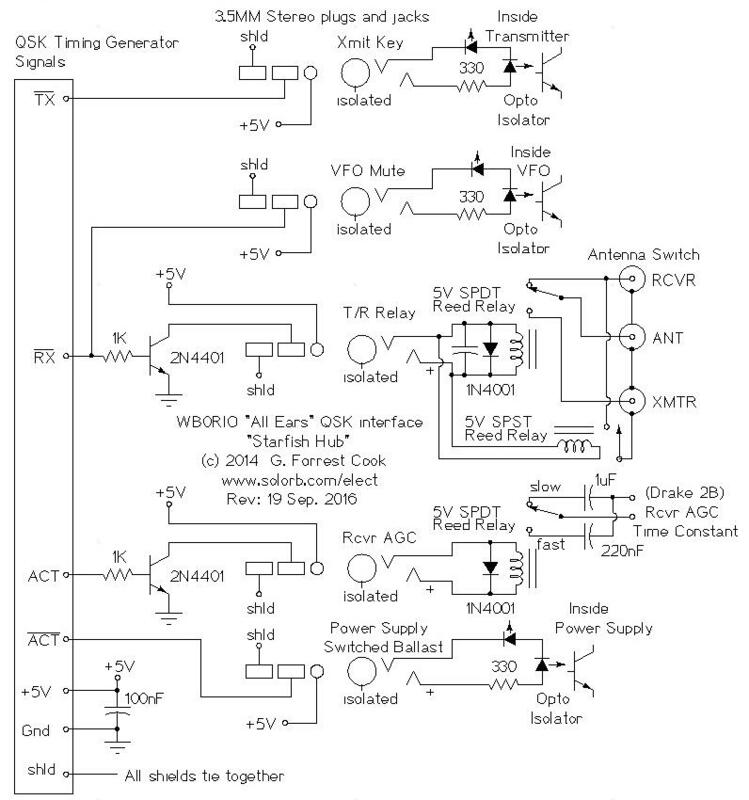 The design of a QSK-capable radio station is somewhat tricky. A QSK system has to quickly switch the antenna between the transmitter and receiver, key the transmitter, mute the receiver during transmission and disable the transmitter's oscillator during receiving. It is also desirable to change the receiver's AGC response time from fast to slow when not transmitting. By adding small delays at the beginning and ending of the dots and dashes, it is possible to generate signals with slightly longer and shorter lengths compared the original morse code. These modified signals sequence the entire system in order to eliminate transmitted chirps, T/R relay arcing and receiver clicking. Here's a typical sequence for sending one morse code "dit", items in parentheses happen simultaneously: (key down, antenna relay to transmit, transmitter oscillator on, receiver mute), delay, transmitter output on for duration of dit, (key up, transmitter output off), delay, (antenna relay to receive, transmitter oscillator off, receiver unmute) Additionally, the receiver AGC slow/fast signal needs to go to fast at the beginning the the first key down event, and should switch to slow a few seconds after the last key up event. This circuit takes a TTL-level keying signal and produces three TTL-level output signals, and inverted versions of the three signals. This combination of outputs is useful for driving a variety of control circuits that can interface to the transmitter and receiver. 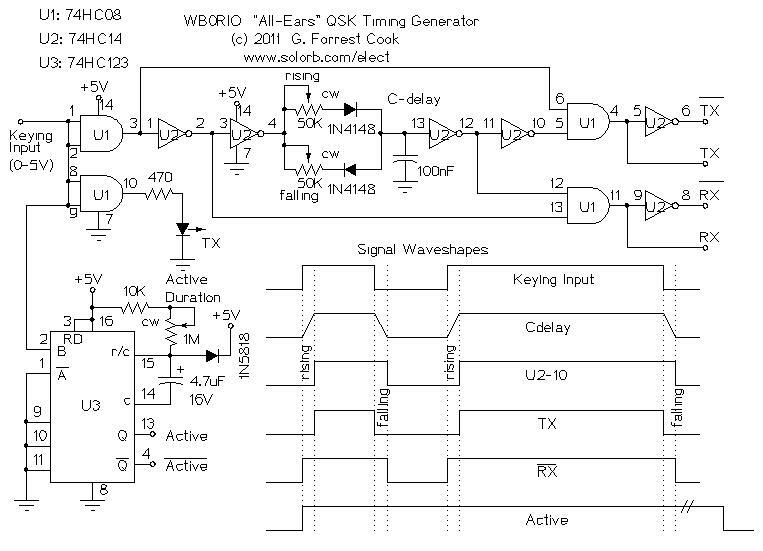 The timing generator also produces the necessary signals for automatic non-QSK transmit/receive switching. 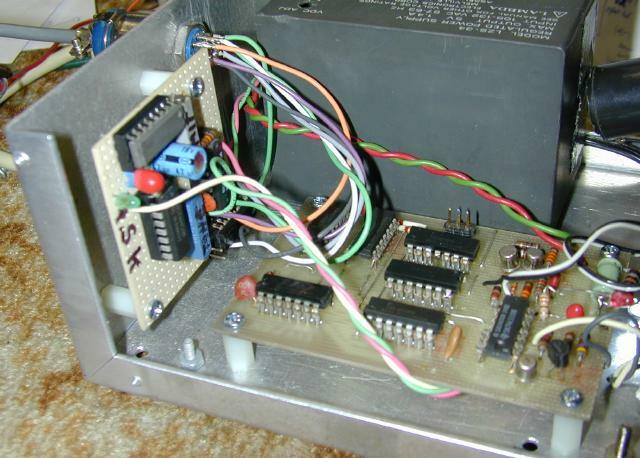 See the Modular CW Transmitter Prototyping System article to see how this circuit can be connected to a receiver, transmitters and related devices. The logic family selected for this project was 74HC (high speed CMOS). This is a relatively modern and low power family of ICs. The circuit will work with other logic types such as 4000 series CMOS or 74LS (low power Schottky). The timing capacitors may need adjustments when working with different logic families. The two main considerations are power consumption and compatibility with the the output of your keyer. A 74HCT buffer stage could be used to convert a TTL level keyer to the HC levels used by this circuit. The external keying input drives three inputs, the timing chain buffer (U1 pins 1,2), the TX LED buffer (U1 pins 8,9) and the Active timer U3. The first two section of U2 produce inverted and non-inverted versions of the keying signal for use down the line. The non-inverted keying signal drives the resistor/diode/capacitor delay circuit. The separate rising and falling controls are used to adjust the rising and falling delays independently. The output of the delay circuit is squared by the next section of U2 and inverted. The inverted delayed signal is inverted again by the fourth section of U2. The keying signal and delayed keying signal (inverted and non-inverted) are combined in the two remaining U1 and gate sections to produce the TX and RX! signals, these two signals are inverted by the last two sections of U2 to produce TX! and RX. The Active and Active! signals are produced by one-shot U3, the active duration control is set so that the active line stays high for several seconds after transmission has ended. The 1N5818 diode is recommended by some IC manufacturers to protect the one-shot chip from back-fed timing capacitor voltage on power-down. The six outputs can be used to drive a variety of control circuits on the transmitter and receiver. Normally, only the inverted transmit and receive lines and the Active lines are used for the QSK system. I recommend using the signals to drive opto-couplers inside of the transmitter and receiver where possible, current limiting resistors should be used between the outputs and the opto-coupler LEDs. The output signals use common stereo 3.5mm jacks and plugs. The "ground" or "sleeve" side of the jacks are left floating to eliminate any ground loops. The jacks should be mounted to their respective chassis via insulating washers. If the jacks have to be mounted to to the chassis, the shield lines should be disconnected on the plug end of the wiring. A fast-acting reed relay is used for the antenna T/R switch. A second reed relay is used in the T/R switch to short the receiver input to ground while transmitting, this prevents receiver overload. A third reed relay is driven by the Active signal to switch a receiver's AGC circuit between fast AGC (transmitting) and slow AGC (receiving). The T/R relay and AGC relays are driven by a standard NPN transistor relay driver circuit, don't forget the backwards diode across the relay coil. If you can find one, a mercury-wetted reed relay makes an excellent antenna relay. A recent addition to the circuit is a switched ballast control for a vacuum tube power supply. The !Active signal controls an optically-isolated MOSFET switch that puts a load across the high voltage line of the power supply when the transmitter is active. This has the effect of regulating the high voltage supply in order to "flatten" out the envelope of the transmitted dots and dashes. This circuit was built inside of the metal box that houses my antique WB4VVF Accu-Keyer circuit board and a 5V power supply. The circuit was constructed on a small piece of perforated circuit board using IC sockets and point-to-point wiring. A solderable prototype circuit board would also be a good platform for construction. Bypass capacitors are not shown in the schematic, One 100nF capacitor should be placed across the VDD (+5V) and VSS (ground) pins on every IC and one 47uF 16V capacitor should be wired between +5V and ground. The six output signals were connected to a 9 pin connector connector along with +5V and ground. The various outputs and 5V DC power from the timing generator are routed from the 9 pin connector through a shielded wire and to an external junction box that is called the starfish hub. The relay driver circuits were built into the junction box. Since the circuit will be used in an environment with a lot of stray radio frequency (RF) energy, shielded wires should be used for all external connections. Only connect the shields to ground on one side to prevent ground loops. Connect a dual-trace oscilloscope to the TX and RX signals, then send a stream of morse code "dit" characters and adjust the rising and falling controls for the desired delays. Another method is to connect everything up and adjust the delays for the minimum amount of clicking. Proper adjustment is largely a function of your specific transmitter and receiver's timing characteristics. Adjust the Active Duration control for desired operation of your receiver's AGC function and the transmitter's power supply ballast load. You may want to mount this control so that it can be adjusted during station operation. Once you have your system up and running, operation is completely automatic. Operating a station with QSK capabilities makes having a morse code conversation feel much more interactive, especially if the operator on the other side also has QSK capabilities.